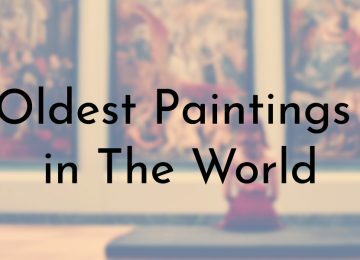 Although there is still a stigma against tattoos in several modern societies, tattoo art and body modification are nothing new. There is archaeological evidence that suggests people may have been tattooing their bodies as far back as 50,000 years ago. 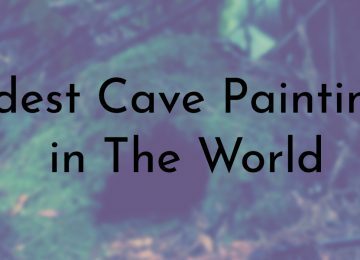 These early finds consists of possible tattoo tools and human figurines adorned with body art. The oldest existing tattoos on mummified bodies only dates back to around the 4th millennium BCE. 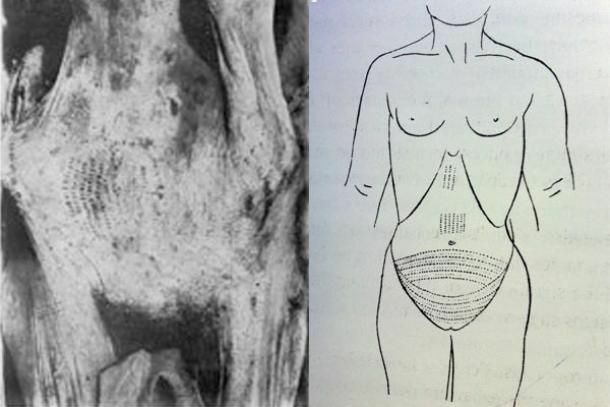 Although the mummy of a Sudanese woman was excavated in 2005, the tattoo on her inner thigh was not discovered until a CT scan was conducted on her body in 2014. The scan revealed that she had a tattoo of symbolizing the Archangel Michael. Her tattoo is a monogram, stacking the ancient Greek letters spelling Michael’s name as M-I-X-A-H-A. 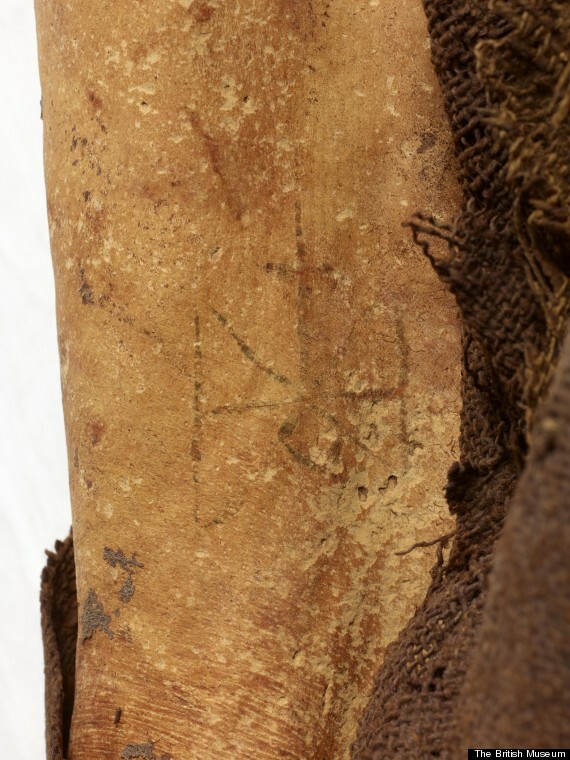 The symbol is similar to others found by archaeologists on church mosaics and artifacts, this is the first time that it has appeared on human flesh. 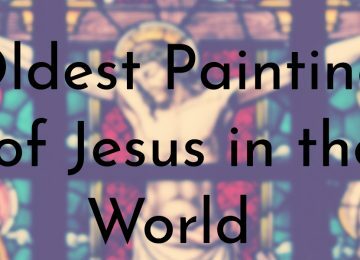 One theology professor believes that she placed that tattoo on her inner thigh for protection against sexual violation or to help her have a child. The Chiribaya were a pre-Inca culture from northern Peru and southern Chile. Several mummies from their culture have been discovered over the years and a few of them are tattooed. 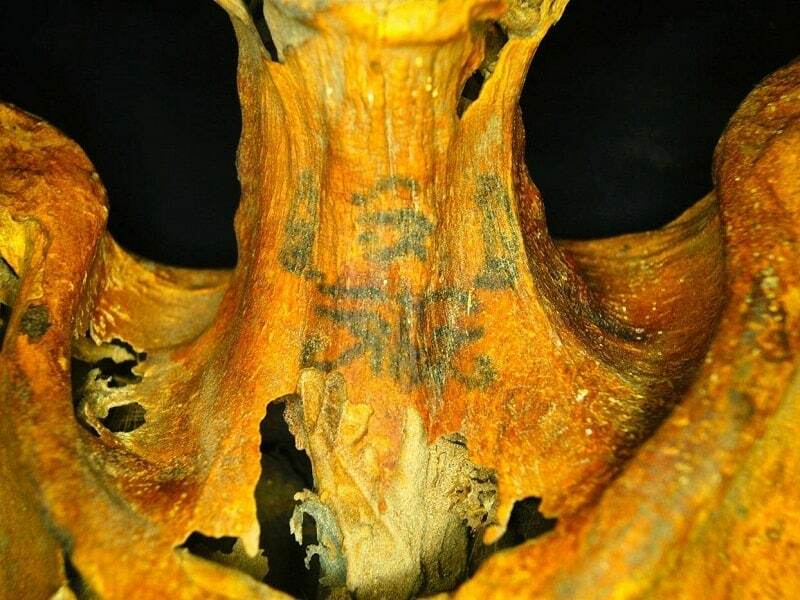 One female mummy, uncovered in the early 1990s, has several tattoos containing burned plant materials. She has a second set of tattoos made with soot like many ancient tattoos. This set features symbols representing birds, apes, and reptiles and were decorative. 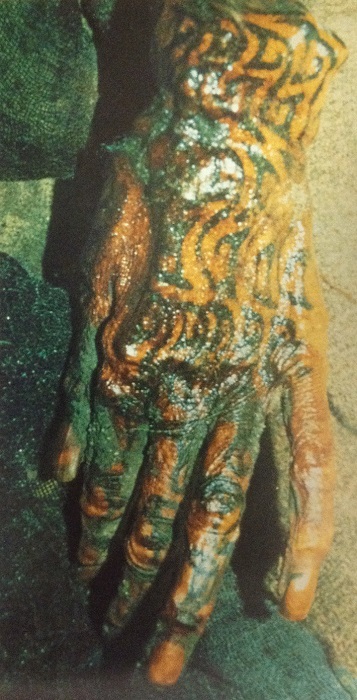 The tattoos containing the burned plant materials depict circles on her neck. Researchers believe that these circular tattoos were not just ornamental, but used for a healing or strengthening ritual. The mummy known as the Princess of Ukok is famous for her elaborate tattoos, which depict mythological deer-like creatures. Her tattoos, as well as those of the two warrior men found buried with her, look very similar to modern tattoos. Unlike the tattoos of older mummies, which mostly featured lines and dots, these tattoos are intricately detailed and highly pigmented. The princess was believed to be of high status or a holy woman because she was buried with six bridled and saddled horses and was dressed in fine clothing. The Pazyryks, the nomadic people that the princess belonged to, used tattoos as personal identification. 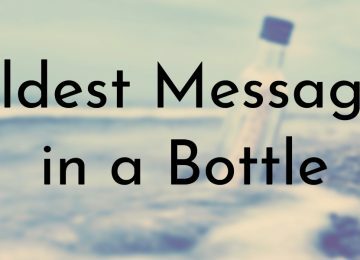 They believed that it would help loved ones find each other easier in the afterlife. Although there are a few Egyptian mummies with tattoos, most of the markings are simple and feature lines and dots. However, in 2016, a bioarchaeologist revealed that a mummy they were studying had over 30 distinctive tattoos depicting detailed objects. This was the first time that an Egyptian mummy was found to have more elaborate tattoos. The female mummy’s tattoos depict lotus blossoms, cows, baboons, and “wadjet eyes” – a powerful divine symbol that wards off evil. Her tattoos stretch across her hips, arms, back, and neck. Researchers believe that her tattoos suggest that she was an important figure who may have had religious powers. Since the early 20th century a large number of well-preserved mummies in and around the Tarim Basin have been uncovered. The dryness of the desert has kept many of the mummies in good condition and because of this, tattoos have been identified on several of the bodies. The tattoos were achieved using a puncture technique similar to the method used by the Thracians, Scythians, and Pazyryk. 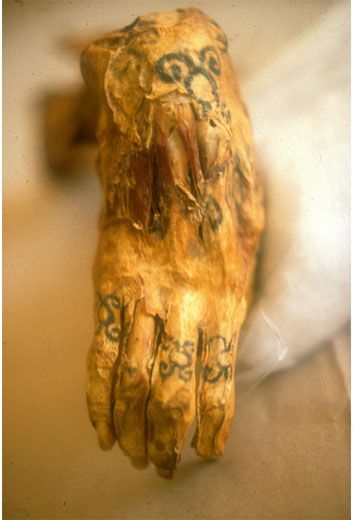 This resulted in darker tattoos than those found on other ancient tattooed mummies. One of the female mummies has ovals and crescent moons tattooed on her face, which suggests Goddess worship. A male mummy, known as the Chrechen Man, has sun tattoos on his temple, which may have represented a male God. The two may have had shamanistic roles in their group. 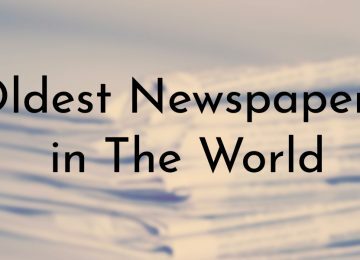 In the late 1890s, several tattooed female mummies were discovered in Egypt. All of the mummies were priestesses of the Goddess Hathor and the most famous mummy in the group was Amunet. At the time of their discovery, the tattooed women were thought to be prostitutes or concubines, and their tattoos were seen as sensual, especially Amunet’s. 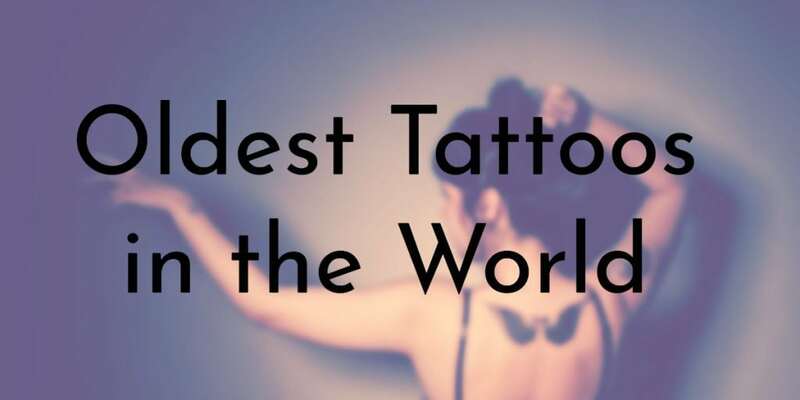 However, today’s scientists believe that the tattoos represented the priestesses’ connection to Hathor, who were on earth to guide and protect women through childbirth. Amunet’s tattoos cover much of her lower abdomen and mid torso. There are also a some underneath her right breast, on the inside of her elbow joints, on her left shoulder, and her thighs. 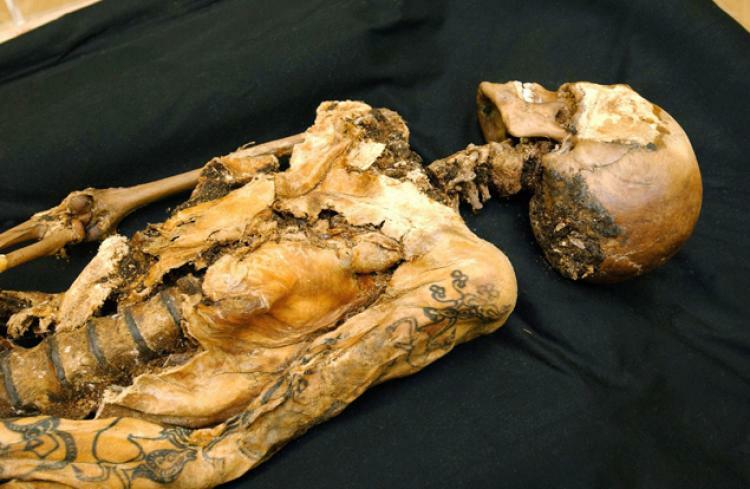 Until recently, the tattooed Chinchorro man was thought to be the oldest existing tattooed mummy in the world. Scientists initially dated his body to about 4000 BCE, but have now determined that he lived much later. Although there are several Chinchorro mummies that are older than the oldest tattooed mummy Ötzi, none of them bear tattoos. The Chinchorro man’s tattoo features a series of black dots above his upper lip, making it look like a thin mustache. These markings are unique to this particular mummy as no other Chinchorro mummy has similar tattoos. While no one is sure, researchers believe that the Chinchorro man’s tattoo was indicative of social status or tribal allegiance. In 2015, scientists studying Ötzi the Iceman’s tattoos declared that his were the oldest tattoos in the world. 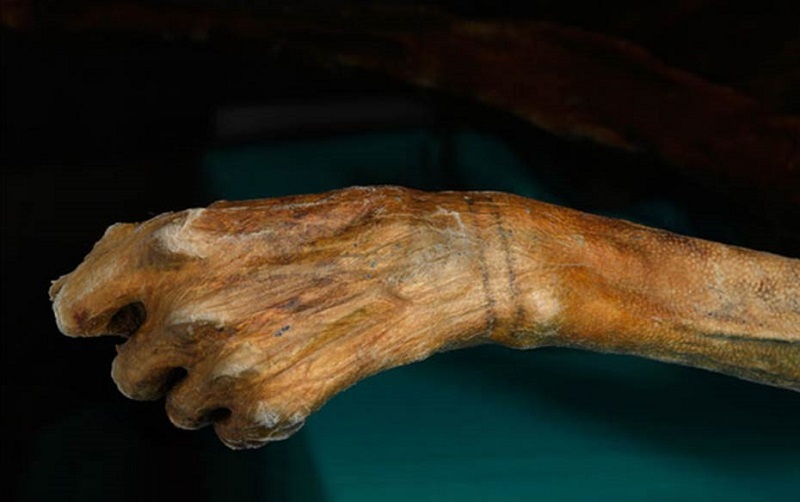 For many years, the tattoo on another mummy known as the “Chinchorro Man” was believed to be the oldest surviving tattoo, about 1,000 years older than Ötzi’s. The new research concluded that the Chinchorro Man was not as old as previously thought, making Ötzi’s tattoos uncovered so far. Ötzi has 61 tattoos on various places of his body, including his left wrist, lower back, torso, and lower legs. There are 19 groups of black lines ranging from 1 to 3 mm in thickness and 7 to 40 mm long. Researchers say that while Ötzi’s tattoos are currently the oldest, they demonstrate that the practice of tattooing predate him. They believe that older mummies may also have undiscovered tattoos.